Key Lime Pie brings back memories of growing up in South Florida. Almost every Sunday my brother, parents, and I would have dinner with our grandparents and on almost every ride home my brother and I would somehow manage to have our allowance rescinded for the week. I used to order Key Lime Pie for dessert whenever I had the chance, so even if my allowance was taken away I would still go to bed happy as long as I had my pie beforehand. I haven't had Key Lime Pie much since I left Florida, so when my friend decided to host a Tropical themed shabbat dinner I knew this would be my chance to cool us down during the hot summer season. I had trouble finding key limes in the D.C. area so thankfully my mother had visited from Florida the week before and brought me a bag. I juiced the key limes when they arrived and froze the juice until I needed it. I was inspired by a few different recipes when I created this pie. The ginger snaps came from my friend back home who makes a fantastic Mango-Key Lime Pie which I will have to make at some point; but the ginger snaps and coconut really make the crust special. They add a little extra bite that will keep your guests guessing. The filling came from the recipe used at the Mar-a-Lago country club run by Donald Trump in Palm Beach, Florida. Although I've never had the Key Lime Pie at Mar-a-Lago, Oprah said it's the most requested dessert on their menu; so I figured I'd trust her on this one. Thanks Oprah, the filling was indeed delicious! Preheat the oven to 350 degrees F and spray a 9-inch tart pan with non-stick spray. Mix together the graham cracker crumbs, ginger snap crumbs, coconut, and butter until well combined. Press the mixture evenly into the tart pan and make sure to cover the bottom and sides. Bake for 10 minutes and remove to a wire rack to cool. I made the filling while the crust was cooling. With an electric mixer or a stand mixer fitted with the whisk attachment, whip the egg yolks and lime zest at high speed until fluffy. This took me about 4-5 minutes. Slowly add in the sweetened condensed milk and continue to whip for about 3-4 minutes until the mixture begins to thicken. Lower the mixer speed, add in the key lime juice, and mix until just incorporated. Once the crust has cooled, pour the filling into the crust and bake for 15 minutes (with the oven still at 350 degrees F). Remove from the oven and cool on a wire rack for 30 minutes then refrigerate for 30 minutes or overnight. Whip the cream, vanilla, and powdered sugar until nearly stiff. I chose to pipe the cream around the edges of the pie and served immediately, but if you'd like to you can spread the whipped cream over the top of the pie and place in the freezer for 20 minutes prior to serving. Mmm. Perfectly smooth and untouched Key Lime Pie. 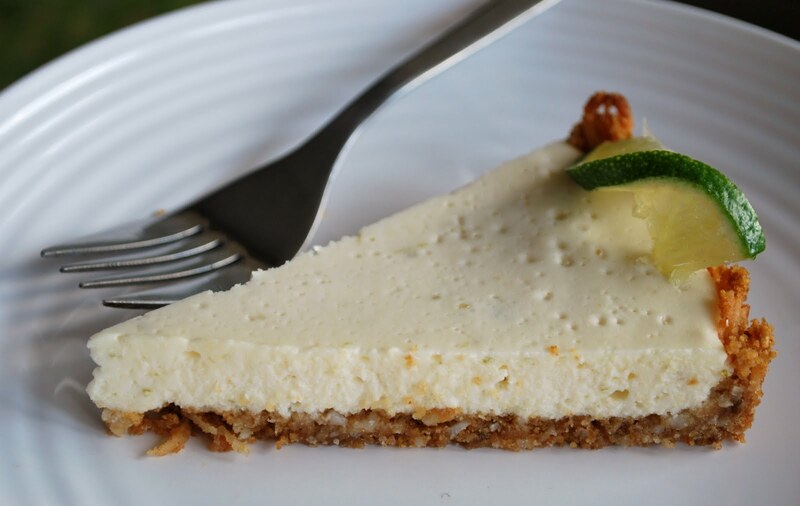 Now you can sit back, relax, and think about being on the beach while you enjoy your slice of Key Lime Pie! YUM!! I've never had a key lime dessert but this really makes me want to try out key limes!! It looks delicious!! Looks great! I love how easy key lime and lemon pies are to make. AJ- you're blog looks great. I've always wanted to make Baklava, so I think I'll try your recipe soon. Yum! Love the idea of putting gingersnaps and coconut in the crust. As a fellow South Floridian, key lime pie is a staple in my diet. Will definitely be making this soon.